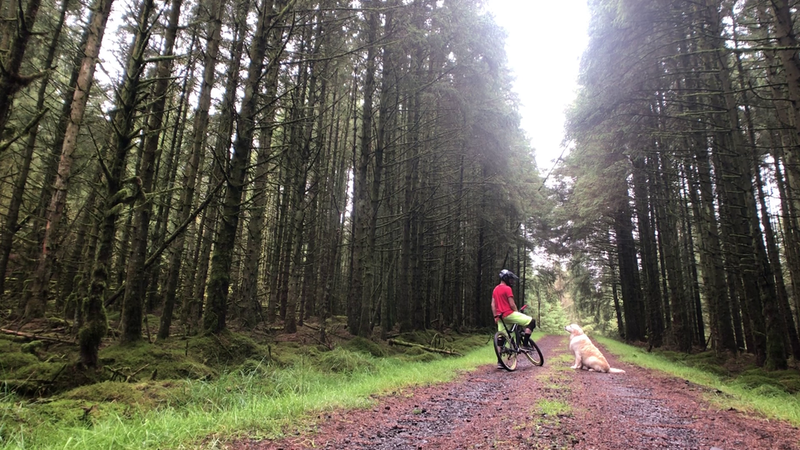 Magnificent forests, endless mountain views and exciting single-track trails - whether you're thinking of getting into mountain biking or already addicted and want to try somewhere new, put Davagh Forest on your list. Note! 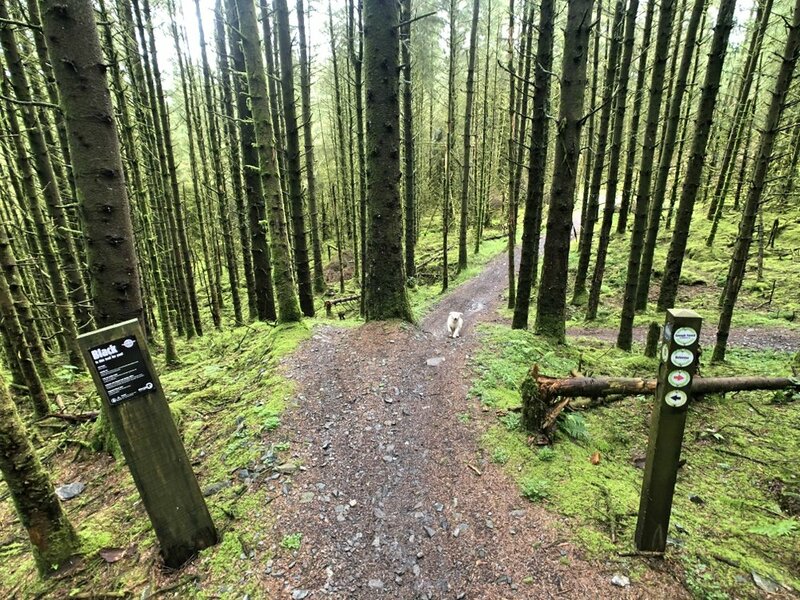 There are also great walking trails here - check out Walk NI's guide to Davagh Forest here. And if you need to hire a bike, you can do that too. More on that further below. 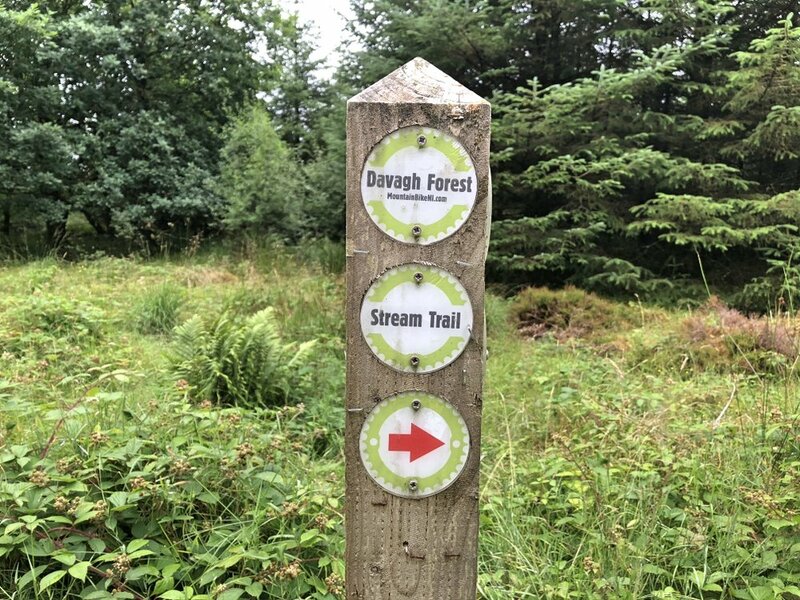 Davagh is about 6 miles north west of Cookstown and easily found on most phone maps –with the forest covering 15km2 though, make sure you search for ‘Davagh Forest Trails’, so you end up at the right starting point. Once in the area, the brown signs will keep you right. From Belfast, the inconveniently-placed Lough Neagh means you’ve two choices - head north on the M2 towards Magherafelt or south west, on the M1 south west towards Dungannon. Both are around 1 hr 10 mins – go for whichever motorway is closest to you. From past experience we’ve been stuck behind less tractors on the northern route. From Derry~Londonderry, it’s about 50 minutes coming through Claudy then Draperstown. …maps of the trail and a fun pump track to get you warmed up before heading out on the trails. A five minute ride on past the pump track brings you to the trail head. Look out for the flash of blue from the Chain Reaction Cycles logo - a big sponsor of the trails in NI and who have just confirmed renewed support (literally just found this out while writing this). You’ll also notice the ‘Blue Trail’ marker for this section. Green – EASY - wide, flat terrain suitable for those who can ride a bike, in decent health. Blue – MODERATE – narrower trails with small obstacles, for those who are confident riding a bike off-road. 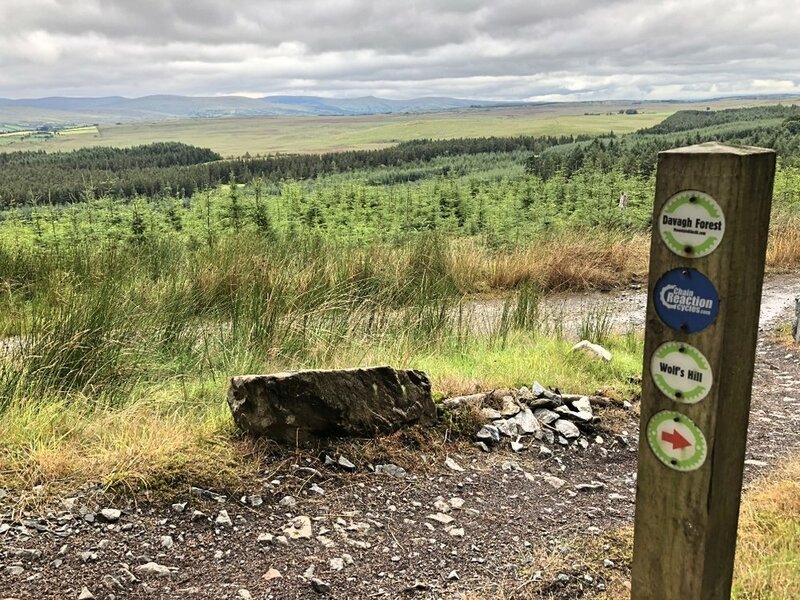 Red – DIFFICULT – challenging trails with climbs, tricky descents, larger obstacles, for those with good experience riding off-road and in good fitness. 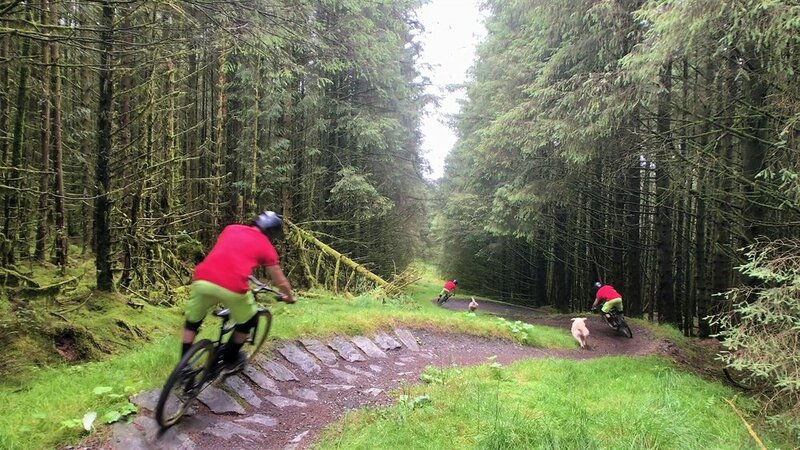 Black – SEVERE – high level of fitness and bike quality needed to tackle very challenging, potentially dangerous drop-offs, corners and all sorts of obstacles. 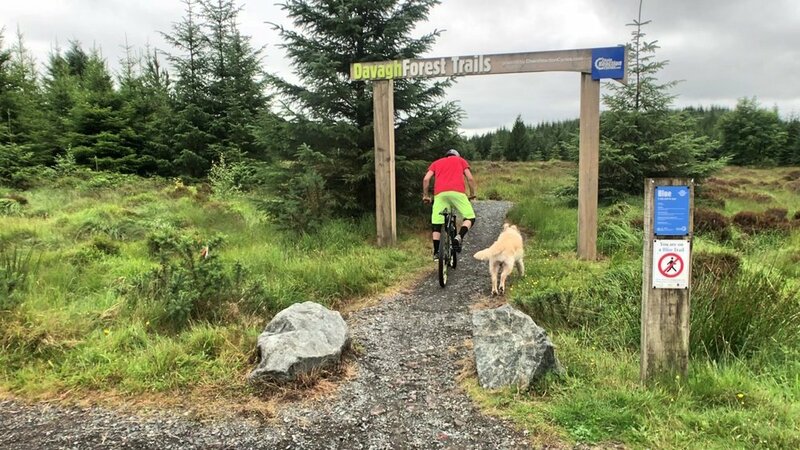 Davagh Forest is packed with 3km of green trails, 7.5km blue trails and 16km of red trails. 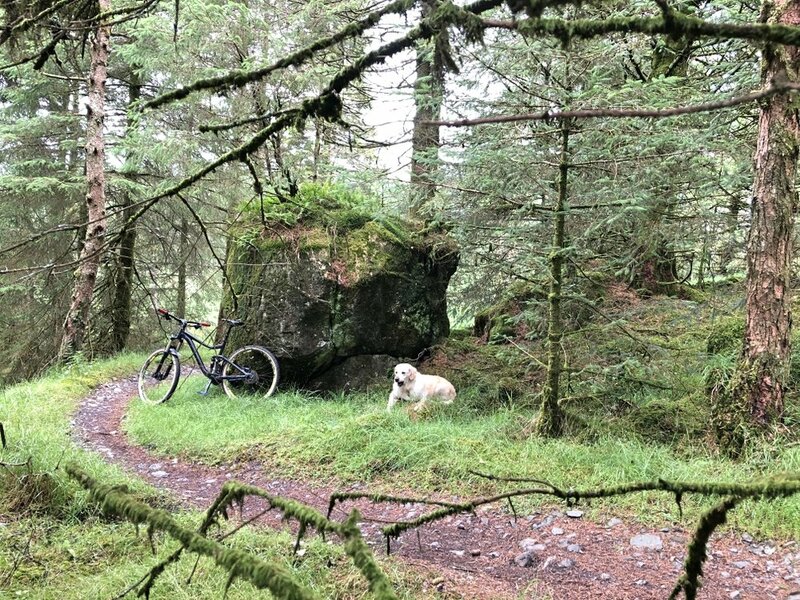 So if you’re just getting into mountain biking, the place is perfect with lots of fast flowing sections, fun twists and turns, small jumps and even optional Black Grade obstacles to tackle if you dare! After the initial fun blue section, you'll be glad to hear the hardest part of the day is tackled early. 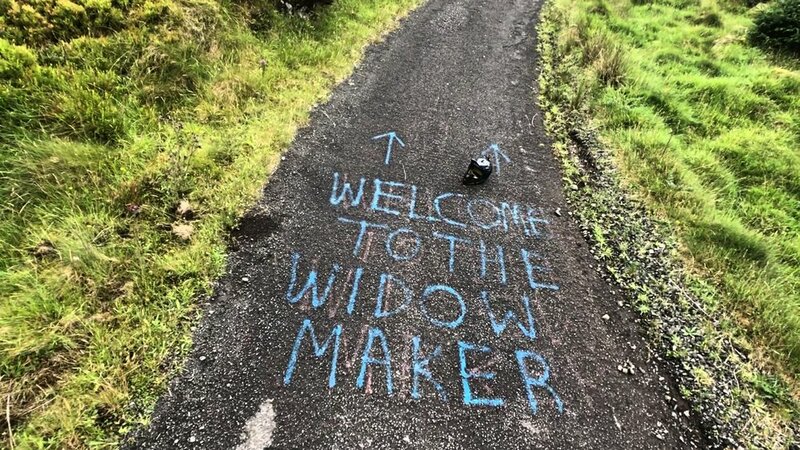 Nicknamed "The Widow Maker", this is the start of your climb up Beleevenamore Mountain. Thankfully, the ascent is broken up by flat sections for you to catch your breath, even if only for a short while. 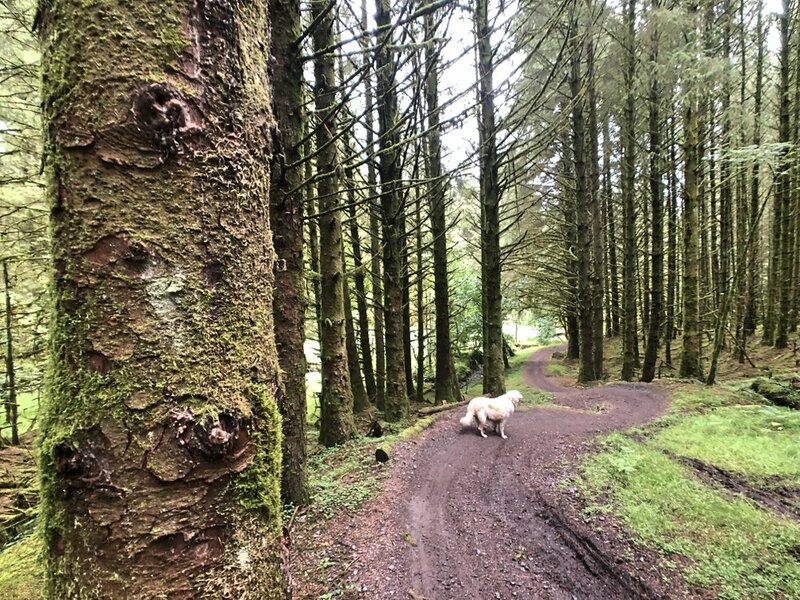 You'll also be rewarded by breath-taking scenery - with packed tall forests and endless views out across the Sperrin Mountains. One of our favourite parts of Davagh. ...and yes, nice little motivational signs to push you on. Max putting on a brave face/snout here. That white dot on the left is Max. 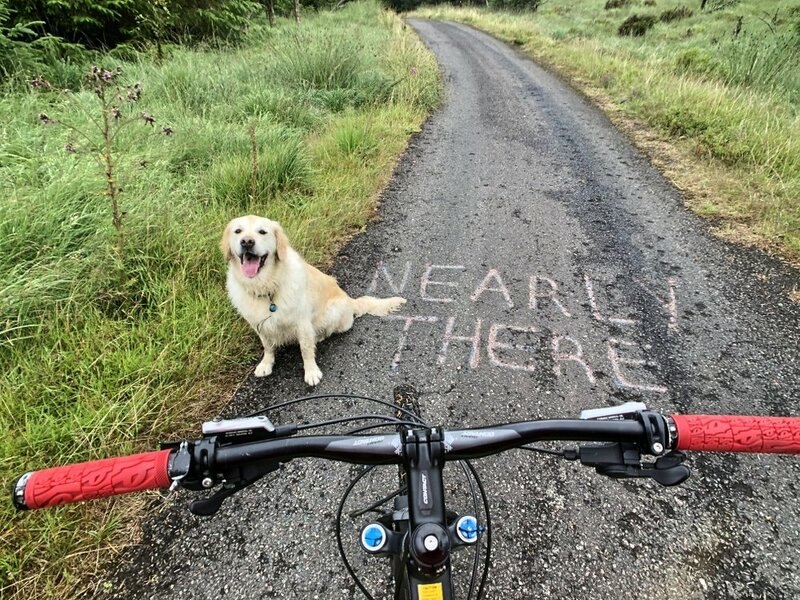 Head over there and check out the trail map - you'll be motivated seeing how far you've covered already. Top left is where you started; bottom centre (just to the right of the 'Beleevna' label) is where you are now. Take note of how the red trail now splits into two long, wiggly lines. While both are equally as fun, we're taking the right trail today, as we want to check out Wolf's Hill and then take the fire road (the white line) over to the uber-fun Stream Trail. ..the first Black grade obstacle. 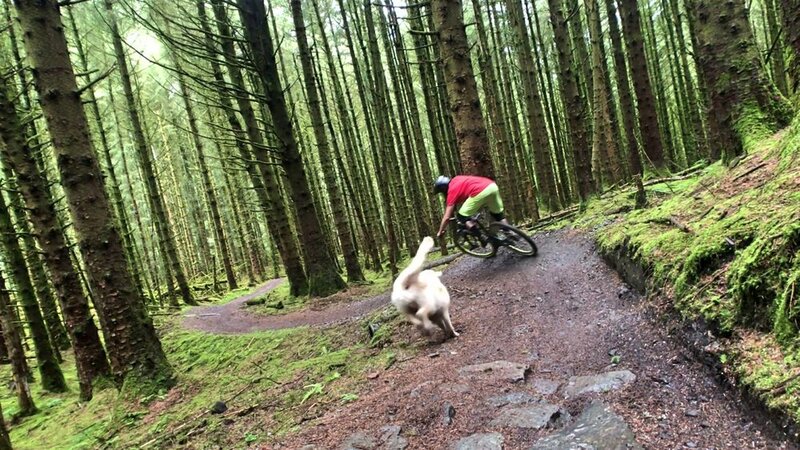 You've the option of going round to the right to avoid it, but if you're just getting into mountain biking it's a great one to practice on. With it being a short, straight drop, as long as you don't suddenly turn, you'll be down in an instant. 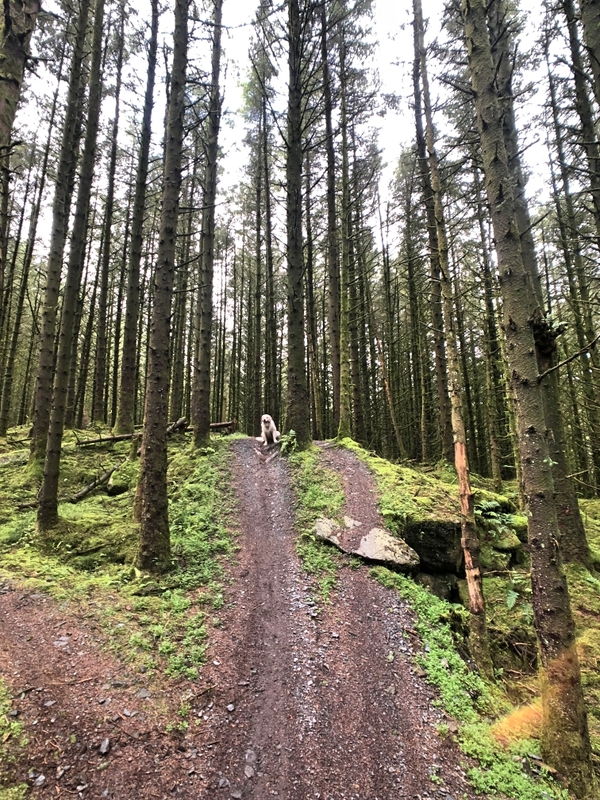 Coming out of the forest, you're rewarded with more amazing views of the Sperrins, with the aptly named 'Christmas Tree Run' and the rest of the 'Run Ragley Run' trails just ahead of you. 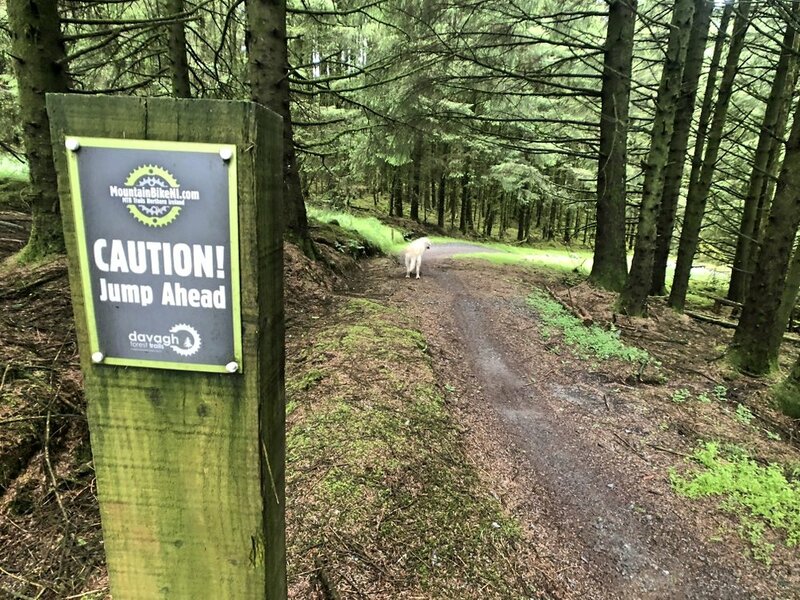 At this point we did a right-left-right along the fire road to bring us to probably the most fun, flowing parts of the Davagh Trails. ...and if time and energy is on your side, head back up the fire road and do it all again! Definitely worth it. With time quickly passing and thunder predicted for this afternoon, we skipped on down the fire road and cut back into the forest at signpost 21. A huge slab of a thing, there are two options for getting off it. In the pic above, to the left is a drop-off we've yet to tackle. Marked 'Orange' for severe', this is definitely one for the more skilled rider. A tricky drop that even on four legs takes a few seconds to figure out where gravity will take you. More great views though. #DavaghRocks if you're on Instagram. We opted for the right hand side - still a bit of a drop, but definitely less chance of taking a ride in the Air Ambulance after. From here, we took the short ride back to the trail head via the fire road (our bellies were rumbling). First, one of Davagh's most famous sections that we didn't have time to venture to. Eagle's Rock - one for only the skilled rider, you'll find this at the north east section of the red trails (labeled on the map above). ...and a great 8 minute long video of the flowing Strem Trail and Big Wig Jig run. 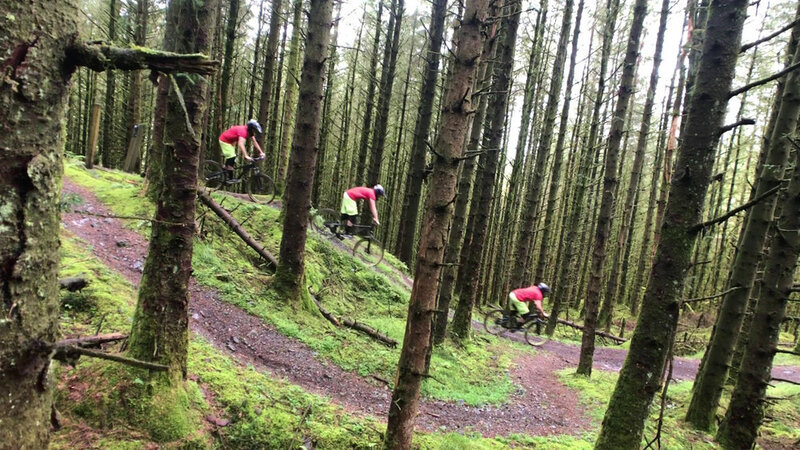 ...and more info on Davagh, check out the MountainBikeNI site here. Check in with the team at Outdoor Concepts before you go. Remember to also bring water, snacks and extra layers in case the weather changes when out.